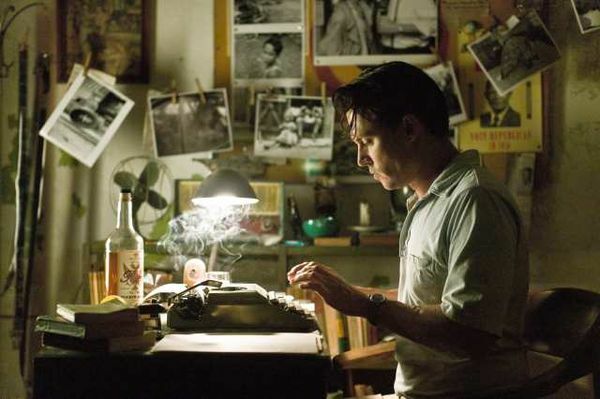 Still Frame from Rum Diary. Notice the background is darker than the subject. Disclaimer: I do not claim to be a master at anything. I’m simply sharing what I learn as I continue to embark on my journey to become a successful Director/Cinematographer. Today I’m going to go over some lighting techniques that are simple and should help produce cinematic images. Those of you who attended film school probably had three point lighting pushed on you all the time. I know that was and still is the case for me. Three point lighting is great especially for documentary interviews. It allows you to setup pretty fast and then adjust. Although three point lighting is great, I find that I rarely use it for films. This is because I find reverse lighting produces a better image. Also reverse lighting is simpler to set up. Reverse lighting basically means your key light comes from behind your subject in lieu of in front. This creates a better falloff. You can then add some fill from the front. This setup is fairly easy and fast to do. The images below was done with two lights or less. This is a screen grab from our short film “Confliction”. The key light (500 Led light) is coming from behind the subject and slightly to the left. The result is a nice falloff and seperation from the background. The fill light (4 z96 lights) is coming from the front left. The next screen grab is from a concept film we did called “Obsession”. The same process was done here expect only one light was used. The key light (500 Led light) is behind and to the right of the subject. Fill was added by simply using a reflector. Another thing you’ll notice in cinema is eye light. Eyes are tremendously important and that’s why you almost always see a sparkle in actors’ eyes. However this is often forgotten by most filmmakers, myself included. Many times I have forgotten this and now I have become an eye light nazi. I don’t want to press record until I see a hint of light in the eyes. Eye light isn’t hard to do at all. It’s more about remembering to do it. Here is more screen grabs from “Confliction”. Although the eye light is very subtle, it makes a huge difference. Eye light can be done simply with a phone light. Become an eye light Nazi, it’ll make your actors/actresses performances pop. Not only will it help the actors look good, it helps engage the audience in the emotions the actors are performing. Next part of this series will cover how insert shots are psychologically pleasing and simple camera movements that will help make your films more cinematic. Follow me on twitter (@Shawn_Lights) where I post film tips every hour.